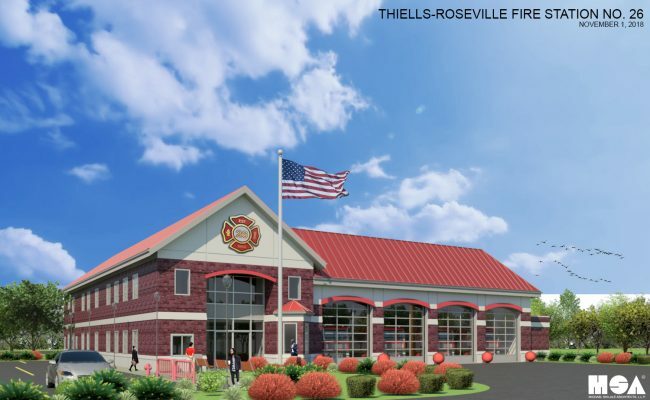 Commissioned by the Thiells- Roseville Fire District to evaluate the construction of a new Fire Department Headquarters. Michael Shilale Architects, LLP (MSA) was commissioned to evaluate the possibility of constructing a new Fire Department Headquarters to accommodate current and future Fire District needs. Our feasibility study focused on the space needs and pre-schematic design for a new Headquarters at the existing site. MSA visited other Fire Stations within the district to compare kinds of space these districts provided and used the size, location and adequacy of these spaces in order to plan for the best possible building space. As a part of our study, we are able to confirm that a new facility would fit on their site, present pre-schematic building floor plans to evaluate how desired spaces could be arranged, and evaluate codes, zoning, and budget requirements. A conceptual rendering was created to better communicate our design ideas and assist the Fire District in gaining support from their stockholders.